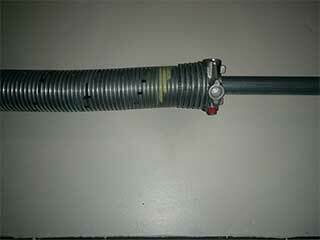 Most homeowners don’t worry about their garage door springs until they are unable to enter or leave their garages. If such a problem occurs, then you may suddenly be forced to make a number of repair decisions that you may not feel qualified to make on your own. This is why it’s a good idea to call us. You'll rest easy after our experts help you make an informed decision. By using torque to raise and lower your garage door, these parts slowly coil up on the shaft whenever the pane is opening or closing. There are a number of different sizes and lengths that you can choose from and it’s important to always use the correct one so that your door will operate safely. We highly discourage anyone from trying to replace their springs by themselves. Without knowing how to pick the right one based on track radius, weight, and height, you can very easily create a dangerous situation. These are the most common types of springs. They extend along the horizontal tracks that run along the sides your garage door. They extend to open the door but have to be installed correctly with safety cables to ensure that they don't fly off the track if there is a malfunction. The best way to make sure that everyone entering and leaving your home through your garage door is as safe as possible is to have one of our experts install a new spring. It can be difficult to know which kind best suits your door, so to ensure that the correct type and size are what gets installed, you will want to work with us as we have not only the experience, but also the handling skill that's required in order to keep you safe. Our technicians are also able to increase the system's longevity through scheduled maintenance checkups that can help catch any potential issue long before it becomes a dangerous problem.